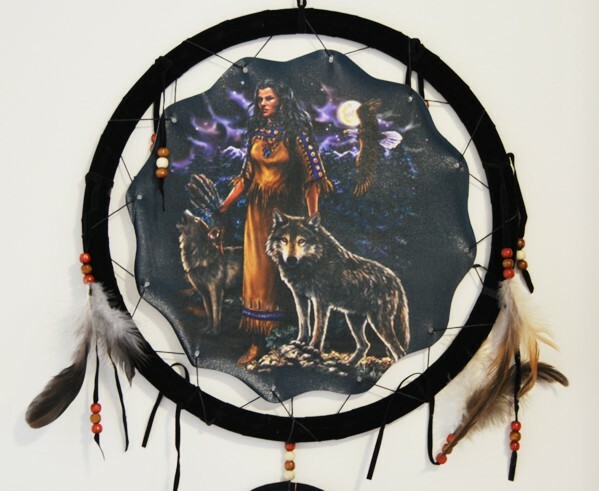 Our Moonlight Companions Mandella with Dreamcatcher features a Native American Maiden with two Wolves standing in a Moonlit Forest. There is an Eagle flying in the sky and one of the Wolves is howling. The vinyl canvas is stretched and tied on round frame. It is decorated with leather, beads and feathers. There is a small dreamcatcher attached to the bottom which is also adorned with leather, beads and feathers. Comes ready to hang. The Hanging size is approximate 32" long.